"'What is this film about? It is about a Man. No, not the particular man whose voice we hear from behind the screen, played by Innokentiy Smoktunovsky.' It's a film about you, your father and your grandfather, about someone who will live after you and who is still "you". About a Man who lives on the earth, is a part of the earth and the earth is a part of him, about the fact that a man is answerable for his life both to the past and to the future. You have to watch this film simply, and listen to the music of Bach and the poems of Arseniy Tarkovsky; watch it as one watches the stars, or the sea, as one admires a landscape. There is no mathematical logic here, for it cannot explain what man is or what is the meaning of his life." 'My reason for writing is Mirror, a film I can't even talk about because I am living it. The legendary, unorthodox and brilliant Russian filmmaker Andrei Tarkovsky ("Solaris","Andrei Rublev","Ivan's Childhood") in the fourth of his full-length seven films he completed before dying in 1986 presents a unique artsy autobiographical film shot in color with parts in black-and-white in The Mirror. His aim is to reveal things imprinted in his memory. Tarkovsky's fascinating meditation on his life, on memory and on time is narrated and witnessed by a quasi-fictional self who never appears on camera. The whole is represented in such a way as to attempt the erosion or even abolition of the distinction between past and present. The Mirror is a series of seemingly unconnected, yet strangely connected memories. As memories, they’re a mixture of the crystal clear and the vaguely outlined. These memories seem to fold in on themselves in a flood—albeit a rather slow flood, since this is Tarkovsky—to a point that order is meaningless. All these times have become one. Similarly, characters change and morph within the space of a scene. It is a film that is difficult to adequately describe and impossible to process and assimilate in one sitting. It is also a film that will never be wholly comprehensible to a non-Russian—possibly even to a Russian who never experienced the time periods depicted in the film. The subtitles of this movie are heard to be far from satisfactory and hardly capture the subtle nuances and poetic power of the Russian script. Some may find this a wholly frustrating experience. In which case, the best approach is probably just to immerse one’s self in the incredible imagery that transmutes even the mundane into something that feels fresh and new. Masha watches as the family barn burns down. The Mirror is co-authored by Alexander Misharin, who brings in refreshing statements on the aesthetic and moral basis of an artistic work. 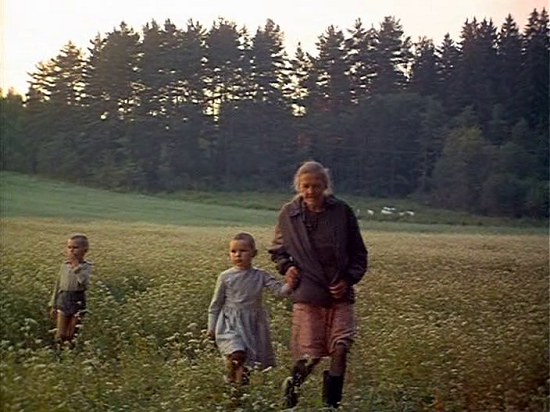 The film is grounded by an unseen dying artist narrator (Innokenty Smoktunovsky) who reflects on three generations of the Tarkovsky's family that covers ground in a non-linear order from his birth in 1935 and his idyllic childhood in the country that was broken only by the divorce of his parents. 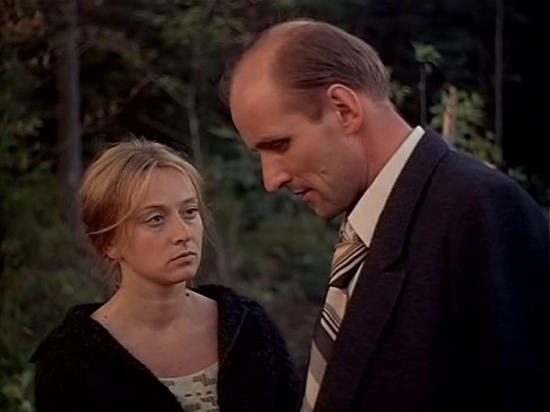 The narrator, representing himself as Andrei Tarkovsky, reflects on his relationships with his poet father, Arseni Tarkovsky, whose poems are read throughout the film in his real voice and give voice to what the film was about, and warmhearted mother (worked as a proofreader at a printing house) as both a child and adult. The narrator also tells of his relationship with his wife and son, and reveals his pungent thoughts on Russian society. The actors have interchangeable parts, which add to the confusion. Margarita Terekhova plays the mother as a young woman and then puts down her pinned up hair to play the wife. It's told without plot, but gets its story across through flashbacks and stunning images. It's meant to be more emotionally felt than being intellectual and though often impenetrable it always remains freshly original in its form and striking visions. Its theme of the effects of lost innocence and paternal abandonment in a troubled world can be universally understood. Tarkovsky shoots for the moon and for the most part succeeds in trying to make his personal story also a lesson in political art, as by intercutting personal events with historical documentary black-and-white newsreel footage of the evils of the Stalin regime to the haunting images of the Second World War (including a stunning sequence of the Soviet Army crossing Lake Sivash) to just what it means to be a Russian. The film is fascinating in breaking down time barriers and other rules of cinema to show how the past appears in the present, and its logic is that of a dream until awakened and things become hazy again. 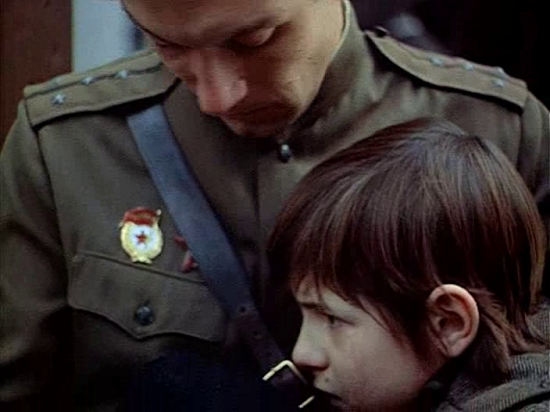 The bulk of the emotional impact of the film comes from scenes of Andrei's fatherless childhood. An early scene shows his neglected mom sitting on a fence by their country homestead and flirting with a passing village doctor who asks for directions. In another great scene there's a mystical flashback following the narrator's father's return from a long absence. His mother washes her hair in a basin and water drips down from the roof as she walks inside the house in a blissful mood and gazes into a full-length mirror, and then in another mirror across the room her image is transformed into an old woman. There will be many other provocative mirror scenes throughout the film. There's a scene that meant much to Tarkovsky as it shows him as a young man testing a military instructor's patience by being difficult, and of him as a child leafing through an art book of Leonardo da Vinci's drawing of "A Young Lady With A Juniper" in his early quest for knowledge that coincides with the joyful moment his father came home on leave. In adding some personal touches, the director had his real-life mother Maria act as the mother in old age, his wife Larissa acts as the doctor's wife to whom the mother sells an earring, and his stepdaughter acts as the red-headed girl with whom the narrator falls in love as a young boy. The Mirror does not engage with a past/present dialectic, but a past/present coalescence: they are not separate entities, but two parts of a whole, a philosophical whole, that is constantly and forever in the process of ‘becoming’. 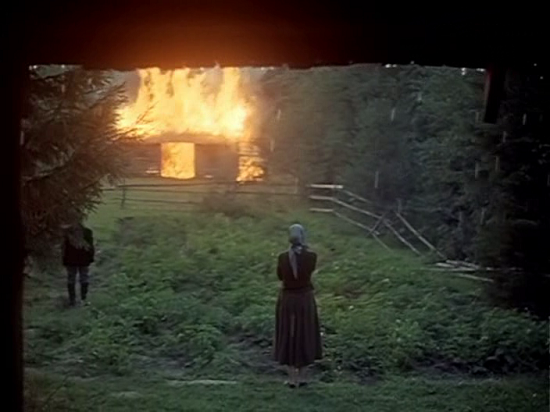 Tarkovsky is showing the processes of past informing present and the present delving into the past. One cannot escape the other; they inform one another, bleed into one another, and together, as one entity, create what we prospect for the future; a future that is marked by the present and, by association, the past. In the edited structure of Mirror, between the allegedly fictitious past and present of Tarkovsky’s narrator/protagonist, Alexei, Tarkovsky has spliced documentary footage of an existent, real, and universal history of millions of others. 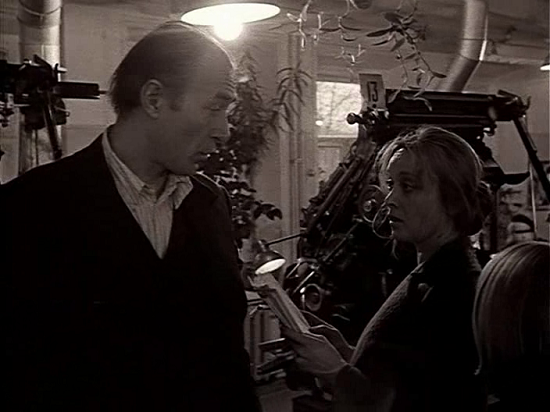 This creates juxtaposition between past and present throughout the film yet, when considered alongside Tarkovsky’s preference for the individual shot as the carrier of time, we can see that these time-frames are not separated but fused by the editing process; their influence on one another cannot be overlooked. As Tarkovsky notes ‘…the cinema image is essentially the observation of a phenomenon passing through time’. In the individual shots time is apparent, such as the distortion of time in the slow-motion scenes, or the scene of Alexei in the doctor’s dacha where the reflective surface of The Mirror acts as a sheet of time, the limit at which past and present meet. Though it is truly a difficult film to get a handle on, the effort to do so is worth it. It's now rightly looked upon as one of Tarkovsky's greatest films.